Recently, on a night off, I walked to the pub that I work in and got stinking drunk. At the end of the night I was screaming “Aarghh Arrrrhh someone’s nicked my bike! !” When I woke up the next day – still wearing my coat and scarf – there was my bike where I’d left it in the living room. But I believe there is a reason I have this bike theft paranoia… Only weeks after buying a bike on Leboncoin I had it was stolen from outside my workplace. It was very much my own fault: I had locked it on the front wheel rather than on the frame. I knew this wasn’t a very secure way to lock-up a bike but it was the only way to lock the bike within constant view of my pubs security guard, so I’d gotten used to doing that while working. On the night in question however I left the bike there and went to a house party (assuming I’d be back to get it around the same time as the pub closed) I went anamalistic crazy at the party and at 7am the next morning woke up alone in the middle of a living room surrounded by empties. I dragged myself back to the Sherlock Holmes pub to find just my front wheel waiting for me. My heart sunk. Afterwards I got myself thinking about bike theft. Was it really just some lucky chancer who had taken my bike? Maybe it was a more professional operation. There was only a 5 hour gap between the security leaving and me returning. By that time of night the streets are mostly void of pedestrians. They would have needed at least a spanner to remove the wheel and then would have had to move a one wheeled bike through the streets without getting seen by the authorities. I suspect there is a ring of bike thieves operating The Night Shift in Bordeaux and I’ve got it in my mind to bust them. To take them down! To set up some ‘bait’ and make a real article around this issue rather than just accounts of my binge drinking. Maybe I should, maybe, just maybe. 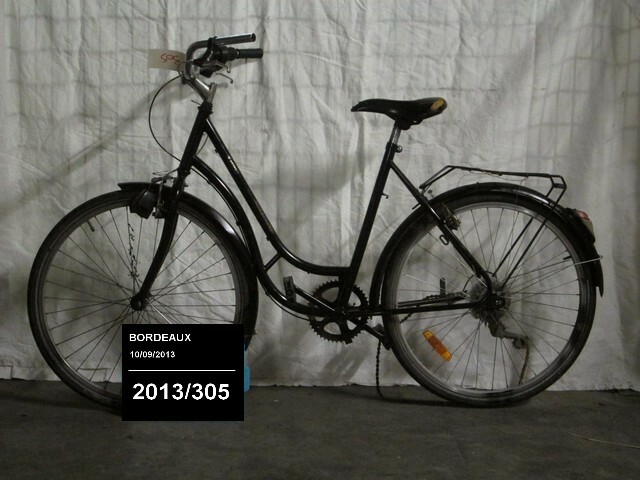 In the meantime here is a website set-up by the Public Security service of Gironde where you can see if the Police have recovered your bike or not. They didn’t recover mine but I like the way police photographs of bikes are almost identical to police mug-shots of criminals. Anyway even if they had found my bike I didn’t have a receipt. That’s one of the reasons I chose to buy my second bike brand new from Amazon. More on that in a future article. For now stay safe kids, and be vigilant. Tags: antivol, bike theft, crimes, stolen bike, vole. Bookmark the permalink. entertaining blog mate…i hope you do catch some of those c*nts. I’ve had a bike stolen aswell as attempted bike thefts (came back to find a half cut through lock). Glad to see i’m not the only one who rides a bike to a house party, although i probably am the only one here in the UK. I also into running, and the company I work for have asked me to write an article about keeping fit in the UK for expats. · Reasons why you should start today! Here is the link to the article, http://blog.myglobalparcel.com/expat-advice-keeping-fit-in-the-uk/ I’d much appreciate your feedback!